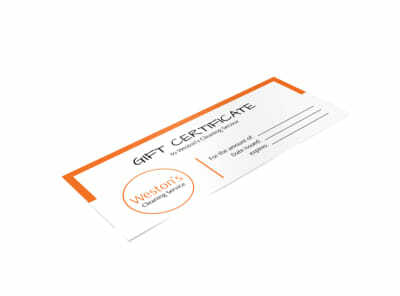 Give clients a new option for gifting by using our cleaning gift certificate templates to customize gift certificates for your business. Everyone loves a clean house, which makes gift certificates a unique but welcome gift. Design your own certificates using our professional templates to tap into the huge gift certificate market. You can upload photos or a logo, manipulate text and graphics, or select images from our stock photo gallery. Once your design is up to par, let us print your certificates using CMYK printing, or print on demand from your own office.